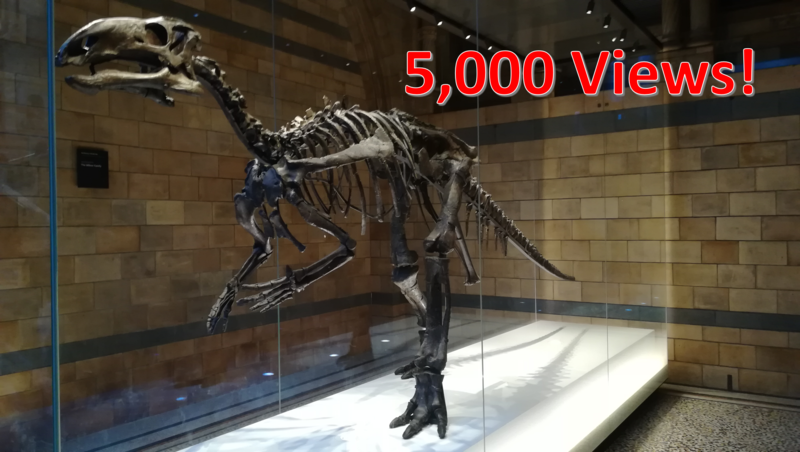 Jurassic Finds Reaches 5,000 Views! In this brief article I share more about the blogs progress and say ‘Thank You’ to everyone who has read my posts. Just a really quick post! As of this moment Jurassic Finds is 14 views off of 5,000! If you are reading this now then you are contributing to getting this blog over the 5,000 view mark! I want to give a massive ‘Thank You’ to everyone who has read my blog posts over the past couple of years, without all of you reading my articles reaching this incredible mile stone would not be possible! I started Jurassic Finds in January 2018 to share more about my passion for palaeontology and help others discover more about the latest fossil and dinosaur discoveries. I have been very surprised at the continued support the blog has received and the positive reactions everyone has had to my articles. I will be continuing to support Jurassic Finds into the foreseeable future and look forward to sharing more about the latest dinosaur discoveries with you all very soon! In the mean time though if you are new to the blog you can check out all my previous articles here. Previous Thoughts on the palaeontological fieldwork taking place in the Jurassic Mile, Wyoming June 2019.